So ... she really liked my mini Sharpie! When I was a kid, there were some shows that just stuck with me, and one of those shows was Blossom. In fact, for my fifth grade enrichment program project (which was about origami), I got dressed to the nines. That is, for my overweight fifth-grade self I got dressed to the nines. This means I was wearing a homemade black dress with small pink flowers on it, some fancy Mary Janes, and, of course, my Blossom-inspired hat. A photo will be coming -- never fear. Tuvia and I are heading to Nebraska at the end of the month, and there will be gobs of amazing photos of me for your viewing pleasure. 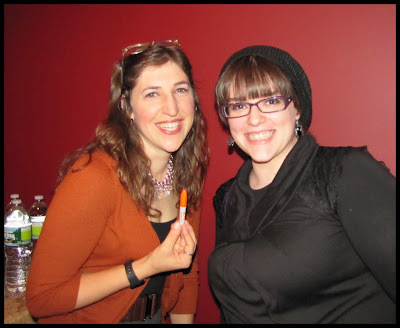 So you can imagine how delighted I was to find out that the one, the only Mayim Bialik of Blossom fame, and more recently of Big Bang Theory (one of my most favorite shows), was visiting my town, Teaneck! I signed up immediately for a pair of tickets for Tuvia and I, and after being rudely quickly shuffled to the event room at a large house in Teaneck that blew my mind, and with my camera at the ready, I was beyond jazzed to meet a childhood hero of mine. And, to think, that when I was a kid watching Blossom I wasn't Jewish, and I didn't even have Judaism on my mind, and all I could think was "Who names their kid Mayim? What does that even mean?" The event was run by Jew in the City -- the amazing outreach site that is redesigning the public image of Orthodox Jews as you read this very blog post. I've been a fan of Jew in the City for eons, and if you're not, you should be. 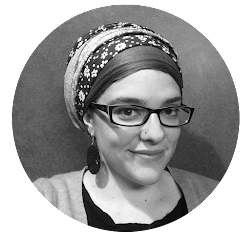 Mayim and the face behind Jew in the City, Allison Josephs, are Partners in Torah buddies, and that's how this amazing connection happened, and all to our benefit! 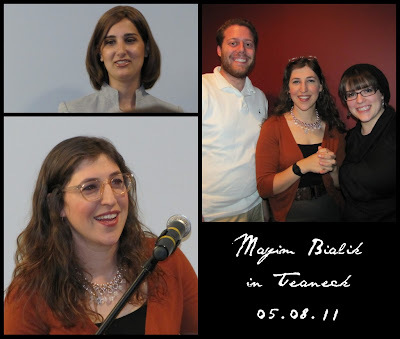 Mayim talked about her background in Judaism, her life as a starlet, and how learning with Allison showed her the beauty in observance and doing things at your own pace. From the first time I met Allison, I felt uber connected to her and her own story of growth in observance. After all, we both had existential crises when we were kids, so HaShem had some of the same work in mind for the both of us. Mayim talked about how Allison asked her: Why did HaShem make you famous? Why did he choose you to make famous? That got me thinking: Why is this blog so well known? Why do people feel connected to me? What is it about my story, my words, my narrative, that other people find compelling enough to email a complete stranger? This is something I'm going to be thinking about. I've always felt that HaShem had a special plan for me, but I've been trying to really peg what that plan is. Maybe it's just the blog? It's reaching out and making the Jewish world a better place? Lighting a fire in all those dimmed neshamot out there? Think about it. 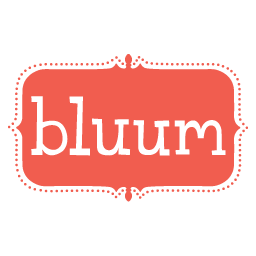 And, while you're at it, go buy some Blossom DVDs!